Location: Kjerringøy brygge, near Bodø. All participants must be present in Bodø at 08:30 a.m. on 27 April at the latest for bus transportation to Kjerringøy. NORSI students at Kjerringøy. 12 NORSI students participated from 4 institutions. Probably the most beautiful NORSI course location! Photo: Gry A. Alsos. 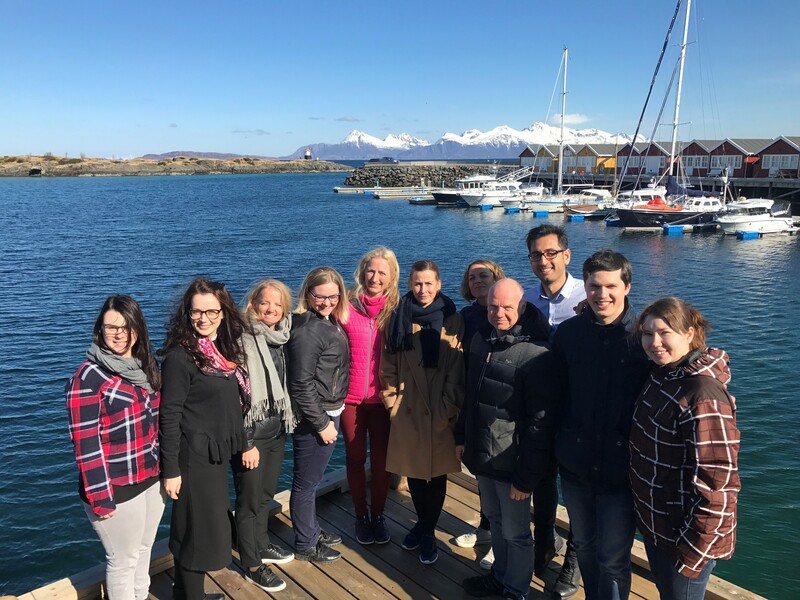 Another sunny photo of students and supervisors at Kjerringøy. 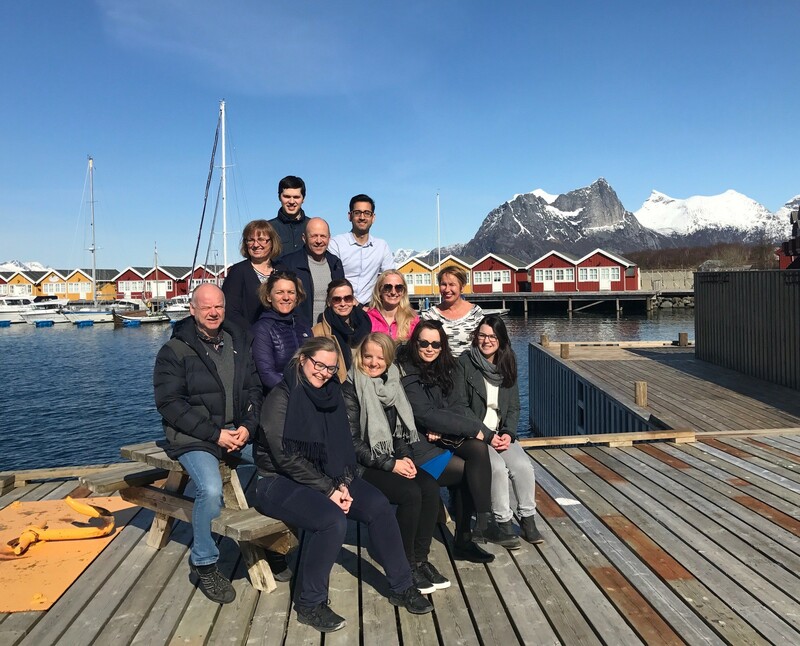 The students who participated were Oxana Bulanova, Mette Talseth Solnørdal,Uladzimir Kamovich, Ann Camilla Schulze-Krogh, Karin Andrea Wigger, Jan Ole Rypestøl,,Karen Landmark, Marta Morais-Storz, Rikke Stoud Platou, Mohammad Javadinia Azari, Hanne Stokvik, and Kine Berild Norheim. The supervisors were Gry A. Alsos, Lene Foss, and Arne Isaksen. The seminar will focus on how “kappas” usually are written and students’ own individual “kappas” that are in progress. Each of the students will analyze about three “kappa” of approved dissertations and present and reflect on these during the seminar. We will discuss various forms of “kappas,” their strengths and weaknesses, and how to fit “kappa” to the articles in the thesis. However, primarily, the seminar focuses on the “kappa” of the individual candidate. There will be set aside plenty of time for presentations and discussions of students’ individual “kappas”. There will also be some writing sessions for students to immediately incorporate feedback they receive for their “kappa’s’”. You will also be assigned a task to be solved the day before the seminar which we ask you to spend 90 minutes on. Students wanting to participate in the workshop, should register by sending an application by email to Birte Horn-Hanssen: birte.m.horn-hanssen@bi.no Registration deadline is March 15th 2017. Please let us know if you would like singel or double room (accommodation) – see below for more info. There will be room for a maximum of 20 students. Priority will be given to students that are close to complete their articles and about to start the writing of their kappe. A priority may also be given to students from institusions contributing with faculty to the seminar. The seminar is free. Accommodation and travel costs must be covered by the students or their institution. NORSI will not cover travel expenses for this course. Accommodation at Kjerringøy Brygge will be: kr 1325 (single room) or 775 (per person in double room), including breakfast. Please be aware that accommodation will be in modern fishermen’s cottages (rorbu/sjøhus) with shared bathrooms (Three rooms, 2 bathrooms). Meals (lunches and dinner) will be covered by Norsi. Please do not book your travel before you have confirmed that there is space available at the course.